Not that the following video is any less awesome than "The Best Woodworking Video Ever Made", it's just that that video came out first, and this video came out second. 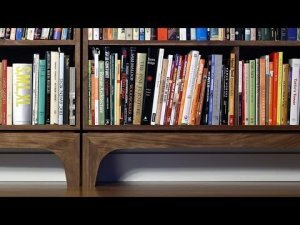 Again, like the first, this woodworking video was shot using stop-motion animation. Not only is the video production amazing, but you can see this woodworker has some real woodworking skills. This is the fully animated story of making four bookcases. The four cases are made from two pieces of walnut veneer plywood with almost no waste. The base for the cases is made from solid walnut with mitered corners The bookcases are 33 inches tall and 47 inches wide. The finish is wipe on polyurethane. They fit under and within the spacing of the windows in the living room. I shot approximately 11,700 frames for this animation and used roughly 6,400 of them. I worked on this project intermittently from the 5th of January to 1st of March, 2014.